Hi everyone! I hope you all had a wonderful Easter weekend. We had a very laid back weekend, enjoying our last few days of Spring Break. I’m not ready for the morning rush to start again, but the boys are both looking forward to getting back to school. Since I’ve been busy with our spring cleaning I haven’t had many organizing projects to share. That should be changing soon, but in the mean time, I have been working on another project and I’m getting close to being finished. I was going to wait and share everything all at once, but I just couldn’t resist giving you all a taste of what’s to come. So, I’m hopping in today to share the first of the 2016 Calendar printables!!! Think of these ones as a preview for what’s to come. Though I’m not sure how much of a preview it really is, but you get to check out the colours that I’ll be using on the monthly calendar printables. (I’m hoping to have those finished to share later on this week, or early next week.) Before I get to the good stuff, there are a couple of things I want to mention. I will not be making a version in the green, purple, blue colour combo. To all of you who like your planners to match, I am very sorry. A new calendar year is a great time for me to play around with new colours and ideas. As much I would love to make a version to match, that’s a LOT of extra printables to make. (12 months x 5 layout x 2 formats = 120 calendar pages) I know it’s not ideal, but I do have blank versions in the green, purple, blue color combo. The new colours are a little more vibrant and a little more saturated than last years. They print really well in grey scale so I won’t be making a black and white version right away, instead I will wait to hear what you all think. I have not figured out the solution to printing the 2 page per month half-size ones back to back. I am still playing around with it. I will share my normal version with the rest of the 2016 calendars, but will share the updated one as soon as it’s figured out. Here’s the full size version! What do you think of the colours? It’s still early enough in the design process that I can switch come out. April and October were yellow this morning, but it hurt my eyes and printed really light in grey scale so I swapped it out. And of course, as always, simply click the pic to snag a copy of your own. I didn’t forget the half-size version! I did make some changes to it though. I got so many requests to have the half-size version designed this way that I felt I had to give it a try. This layout is great for those who like to have their whole year open to them on one page. Let me know what you think. 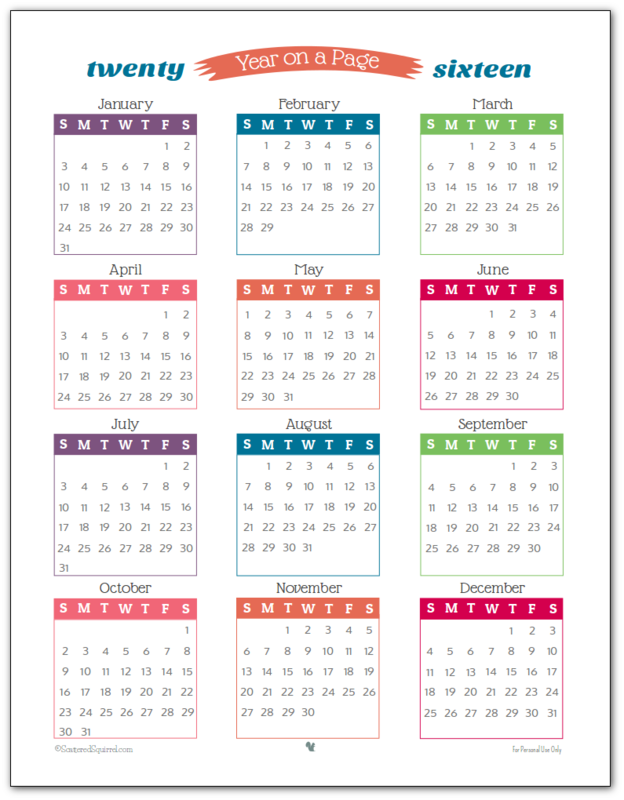 If you need more options for your 2016 calendar here is a fantastic collection of free calendar printables for 2016. I know it’s not a long post today. I just wanted to pop in and share these, and say hi. I’m hopping off to go enjoy our last family day of spring break! I hope you all are having a wonderful day. Enjoy the calendars!!! I can’t wait to share the monthly calendar printables with you all later this week! What do you think of the new colours? Anyone else excited for the 2016 monthly calendars to be coming out soon? Thank you so much for these printables. In response to printing back to back, I left a post earlier today about a quick fix for the users. But you probably have not had a chance to read it yet. For those who want back-to-back, simply print the odd pages first, then turn the stack correctly to print the even pages last. I was unable to find an odd only and even only option in Adobe. Therefore, the user must use 1,3,5,7 for the odd…and 2,4,6,8… for the even. This worked perfectly for me when I printed out the monthly calendar. I saw that Tasha, thank you so much for taking time to leave such a helpful comment. 🙂 The back to back printing issue with the 2 page per month half-size is a bit of a layout nightmare. Each sheet of paper holds a whole month (cut in half for the half-size pages) so printing double sided, cutting them in half, and binding them doesn’t work. I have yet to figure out the right way to lay them out so that when you print back to back, cut and bind, all the months line up just right. I’m open to suggestions if you have any. I’m happy to hear that. I really like them too, and am having a ton of fun playing with them. 🙂 I can’t wait to show off the monthly ones. 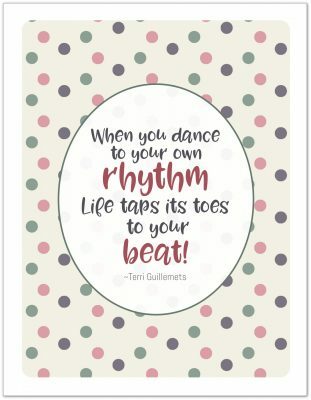 Love all your printables Alli. Does anyone know how to print these so they fit in a personal sized planner? I’ve tried printing them at 75% in Adobe Reader, but the dimensions are off. Any ideas? Hi Heather, what size are your personal planner pages? The half size one is designed to be cut in half down the middle so it becomes two 5 1/2″ x 8 1/2″ pages. For anything smaller than than, I’m not sure how to go about it, but I’ll look into it for you if you would like. I just need to know the dimensions. The personal filofax pages are 3.75 x 6.75. I meant to respond to you before, but I was not able the print the pages for a personal sized planner. I have this problem with all your printables, which breaks my heart cause I love your designs and colors. The files automatically open as Adobe files, so I’m not sure how to print them any differently. I, too, would love to see you develop your printables for personal sized planners. I love your printales! But personal size is hard to find since the ratio dimensions are different than most. Love the 2016 colors! I am a chronic planner, so I am loving that it is out already! Thanks! I’m happy you like the colours Karla. I had so much fun playing with them. Although it would be nice to print the half size months back to back, I simply print a notes page behind them so Im not “wasting” space 🙂 btw, I love the new colors! Can t wait to see what else you come up with! I love the colours. Looking forward to make my 2016 planner. I have never done this before and I am not so good with my PC. It will take some time to work this out. I’m happy to hear that you like the colours. Have fun making your planner. Creating your own can be such a great way to make sure you get one that will work well for what you need. Hi David. Welcome, I’m happy you found us. I know exactly what you mean about the half size of this one. I’m planning to rework it like the 2015 one before the new year hits. I thought I’d try something new, you never know until you try, and it seems people are split down the middle on this one, so going forward I might offer both options. Thanks so much for taking time to share your 2 cents, I always appreciate hearing from others. I love the new colors with more contrast on the pages, it makes it so much easier to find what you are looking for. I loved these but i wish that there was “year on a page (starting monday)”. Love the colors! More my style than pastels and pinks. Give me jewel tones all day! Again thank you for taking the time to produce these and make them free as well! You are very welcome Emm, I hope you enjoy them! I’m interested in a month on two pages with measurements of 4.25″ x 6.5″ (closed) and 8.5″ x 6.5″ when book is open. can you help me with this? Hi Gigi, I’m not sure I can help. You can try adjusting your printer settings to make it smaller, maybe printing at 75% the size would work? I wish I could be more help, but at this time I’m only offering the two sizes. Thank for the printable! I was looking for a 12-month calendar on one page and yours was perfect. Love the colors! Thanks so much Darcy, I’m happy you found one you like! Thank you so much for making this available…a pretty calendar to hang for the year. Love this! Thanks so much for something pretty, but not too foofy to be useful! So appreciate finding half page calendars that will work with my new attempt at staying organized. hello, I just wanted to say thank you so much for taking the time to make these printables. I’m a college student with severe ADD and anxiety and its hard to stay focused and to have a positive attitude. I use your “year on a page” calendar to highlight the weeks I’ve gone to school and it really helps boost my confidence when I see how far I’ve come in my classes. Thank you so much for this.